South Korea announced Thursday a package of measures to help ease the hardships of small and mid-sized shipbuilders who are struggling from a lack of new orders. The shipbuilding industry, once a cornerstone of the South Korea's economic growth and job creation, has been reeling from mounting losses caused by an industrywide slump and increased costs. Recently, South Korea's three major shipyards -- Hyundai Heavy Industries Co., Samsung Heavy Industries Co. and Daewoo Shipbuilding & Marine Engineering Co. -- have enjoyed a rise in new orders, but smaller players are still struggling. The measures call for the government and private companies to place orders for a combined 140 vessels powered by liquefied natural gas by 2025, including two next year. LNG-powered ships are a more eco-friendly option that meet strengthened regulations, raising expectations for a niche market for smaller industry players. 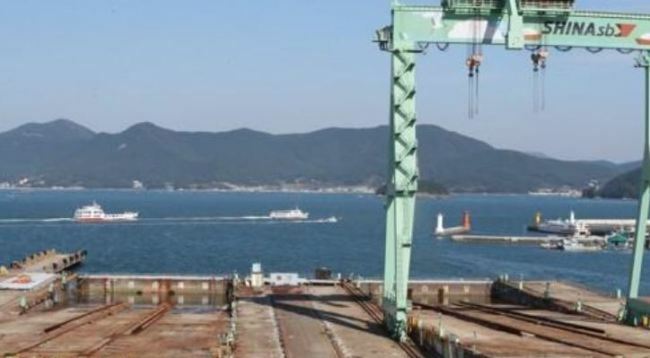 The industry ministry expected the orders to create a new market worth around 1 trillion won ($890 million) for small and medium-sized shipyards. Last year, 78 smaller shipbuilders in South Korea posted slightly over 600 billion won in combined sales. The government and the private sector plan to invest 2.8 trillion won by 2025 to build infrastructure for the operation of LNG-powered vessels. Under the measures, the government will also provide cash-strapped shipbuilders and suppliers with 700 billion won in new financing and roll over maturing loans and debt guarantees worth 1 trillion won by one year. In addition, the government will push to extend the period of special state support for employment in the shipbuilding industry by six months to June next year. The ministry said the package may help local shipyards to overcome their current crisis and take the top spot in the global shipbuilding industry, whose focus is shifting to eco-friendly and smart vessels. "South Korean shipbuilders are expected to win new orders worth 12 million compensated gross tons this year, a level close to their 2014 records," industry minister Sung Yun-mo said. "A full-fledged recovery is expected to start in the second half of next year, when they begin work on new orders." In a silver lining for the local shipbuilding sector, South Korean shipbuilders clinched the No. 1 position in new orders worldwide in the first 10 months of this year, outpacing Chinese rivals, according to a report released early this month.